On April 27, 2013, Ellen Grady and John Hamilton presented a workshop titled "Civil Resistance, What is it? and why do we do it?" at the “Resisting Drones, Global War and Empire" convergence in Syracuse, NY. Part 1 is of John and Ellen presenting on the topic. This is part 2 of the workshop. Part two is the discussion portion of the workshop and it is an audio file. The protest started in front of the Thompson Road entrance to the base. After speeches, music and poetry, the protesters marched down East Molloy Road in a dramatic funeral procession to the base's main entrance, where several were arrested for laying down and blocking the main entrance to the base. Others were arrested for various acts of civil resistance. Sunday's rally was part of the three-day weekend event Resisting Drones, Global War and Empire: A Convergence to Action. See the Post Standard photo collection. happens hundreds of miles above the Earth and all over the globe without much fanfare--namely the satellites and down link stations that give remote pilots real time control over drones. He calls this satellite technology "the trigger." Bruce also talked about the dangers of a nuclear space, capitalism's march toward "opening new markets" in space, the United States Space Command's vision for the future called "Visions for 2020" (a real work of dystopian, global hegemony), among other topics. Drones are apart of US space warfare, essentially. I call the satellites the triggers on the drones because without the satellites, you essentially aren't able to shoot them; you're not able to really fly them; you're not able to see the pictures back at Creech [Air Force Base] and other places around the country where they are flying these drones from. The satellites are crucial links in the whole program. In this interview, Debra talks about her entry into the peace movement, the problems with drones and the PTSD that pilots experience, the detainees in Guantanamo, who are on a hunger strike, and Bradley Manning, among other topics. 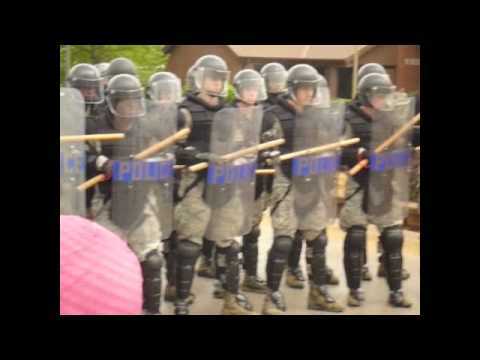 On April 11, 2013, Rochester Indymedia interviewed anti-war organizer, journalist, and blogger David Swanson who will be going to Syracuse, NY on April 26-28th for the “Resisting Drones, Global War and Empire" convergence. (See the FaceBook event: https://www.facebook.com/events/540569232649914/?ref=22.) David runs the website David Swanson dot org and writes, in a coalition effort, on War Is A Crime dot org. Currently, he works for Roots Action dot org and Veterans For Peace. In this interview, David talks about his entry into the peace movement, the abolition of war, the sequester, and North Korea, among other topics. Elliott Adams is a very reasonable and easy person to talk with . A Vietnam War Veteran and past-president of Veterans For Peace, Adams put his body on the line to defend this country against communists only to realize that communists and the Vietnamese were not his enemies, but rather that his own governement was the enemy. To that end, Adams has put his body on the line in the way of the military industrial complex being arrested numerous times for civil disobedience against the unconscionable and immoral actions of the United States government. And now they have drones. It is important to understand that drones are being used to commit war crimes... It will not be stopped unless we the people make it stop. On April 10, 2013, Rochester Indymedia had the chance to interview veteran and peace activist Elliott Adams who will be going to Syracuse, NY on April 26-28th for the “Resisting Drones, Global War and Empire" convergence. Check it out! For more about the upcoming, anti-drone "Resisting Drones, Global War and Empire" convergence in Syracuse, NY, please go to Upstate Drone Action dot org. On April 4th, Rochester Indymedia had the chance to speak with Nick Mottern--a Vietnam War veteran turned anti-war activist. He runs the website KnowDrones.com and he has traveled nation-wide showcasing his model drone exhibit in order to raise consciousness about the negative moral implications of drones. 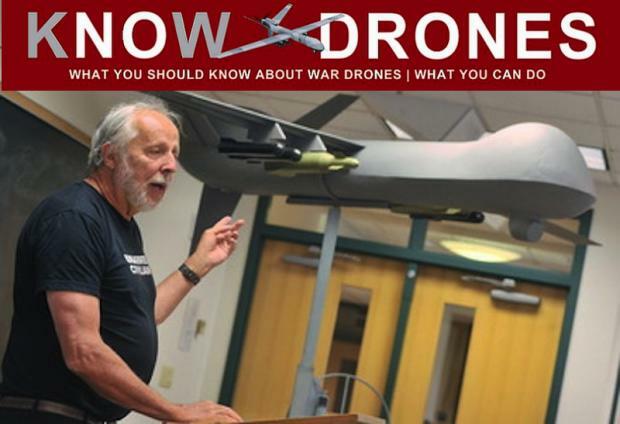 In addition to his current antiwar activities, he teaches workshops on how to build model drones and will be giving a workshop at the convergence being held in Syracuse, NY—Resisting Drones, Global War, and Empire—from April 26th to 28th. WS – Do they run on doughnuts? – Coming soon to a neighborhood near you… Collateral damage. The US is at the dawn of “a new era in police surveillance,” the Associated Press revealed casually last week. In a Chicago-based story about the growing use of drones and other sophisticated, unmanned aircraft for aerial surveillance, it noted that the Congressional Research Service considers their future use “bound only by human ingenuity.”The story focused on one Illinois legislator who has proposed a limit on how far law enforcement agencies can go. But bills have been introduced in almost 40 states, and the Bill of Rights Defense Committee has two model ordinances to assist communities in the emerging movement against domestic surveillance drones. This isn’t science fiction, although the threat of an emerging Surveillance State does figure in my forthcoming novel, Dons of Time. As I learned while researching, drones already fly pretty freely in US airspace. Law enforcement groups use them for search and rescue operations, for security along the border (mainly the one with Mexico so far), for weather research and scientific data collection. In fact, last year Congress authorized the Federal Aviation Administration (FAA) to open the nation’s airspace to widespread drone flights by 2015. WS -Time to quit smoking! A recent solicitation from the Bureau of Alcohol, Tobacco and Firearms (ATF) reveals that the agency is seeking a “massive” online database capable of pulling up individuals’ personal information, connections and associates. On March 28, ATF posted the notice on FedBizOpps.gov, entitled “Investigative System.” The solicitation was updated on April 5 with a few minor changes. 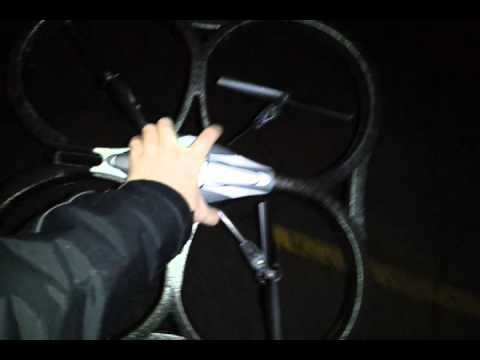 On November 30th I report for six months in a federal prison in Yankton, S.D., as a result of protesting drones. The appearance of war being made easy by drones is resulting in more war. In Afghanistan, Pakistan, Yemen, Somalia, and in places we don't know about, in places where we are not at war, we're sending these unmanned pilotless airplanes into foreign air space to hunt down people who've been accused of crimes only in the private court of the administration. They're hunted down and killed along with anybody who might be in the immediate vicinity. Drones are creating new wars rather than scaling down old ones. Drone pilots in Afghanistan have been targeted and killed. Drone pilots in the United States suffer PTSD at higher rates than real pilots. Drone victims are 98% innocent civilians according to the recent Stanford/NYU study. The other 2% are targeted victims of murder without charge, trial, due process, or in many cases even knowing the target's name. Drones buzzing over houses traumatize children before they kill them. That those children are (in most cases) not American hardly diminishes the immorality. Drones are rapidly being developed and deployed by other nations. Would you support the equal right of other nations to kill with drones in this country? And if not, why not? And how can that thinking not apply to U.S. policy as well? 3 packs of helicopters adorn the sky. Are they the predecessor to Drones US? Raytheon RNC lead up protest tells you the best way to kill people and how to reach the next level in the new Wr Station game called Drone. Solidarity with the Egyptian and Syrian Revolutions!